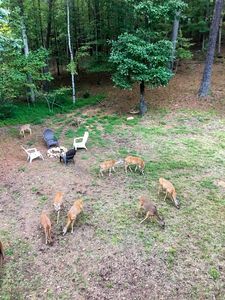 Your peaceful retreat in the North Georgia mountains where you can sit on the deck and watch the deer come right up to feed. 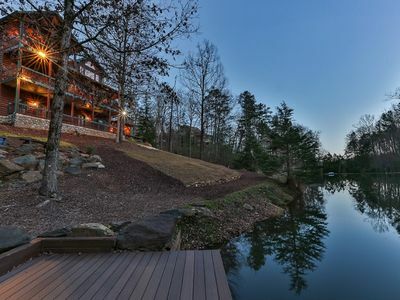 Perfectly secluded yet a short drive to all of the area amenities. If you are looking for a peaceful relaxing get a way, you have found your place! 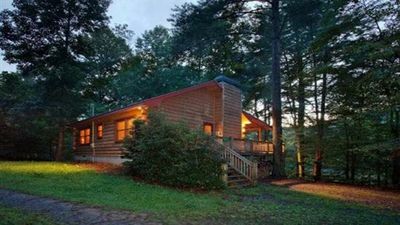 The cabin is situated in wooded and secluded location. Except for the occasional car coming up the gravel road, you would think you were alone with the deer and turkeys. YOU CAN STOP LOOKING NOW!!! YOU HAVE FOUND THE PLACE TO MAKE YOUR MOUNTAIN MEMORIES!!!! We have made every effort to make “Peace” of Heaven Cabin your home away from home and we are certain that it is the place to make your beautiful mountain memories. We realize that you have many options and we work hard to make “Peace” of Heaven Cabin the place that you will want to come back to. We are very proud of our 5 star rating and we invite you to check our reviews below to assist you in your decision making process. If you are looking for a peaceful relaxing place to get away from it all, you have found your place! 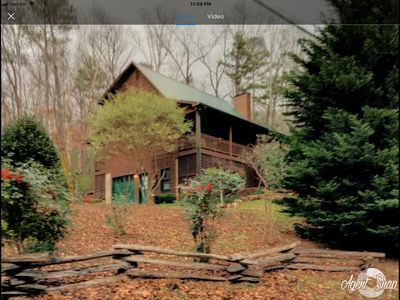 The cabin is situated in a very wooded and secluded location. You may occasionally hear the sound of a car coming up the gravel road, but you would otherwise think you were all alone with the deer and turkeys. 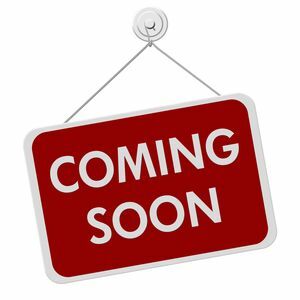 At the same time, it is a short drive to town where you can explore all of the area amenities. 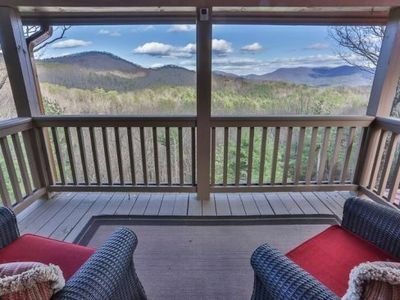 Don t miss your chance to experience the beautiful North Georgia mountains anytime of year. 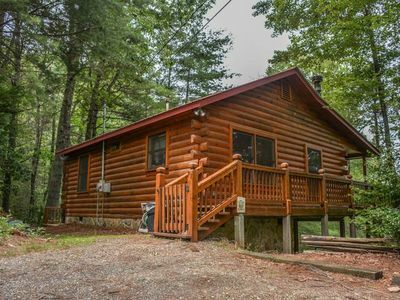 You will fall in LOVE with the area and all the cabin has to offer. We call it "Peace" of Heaven because it is just that. 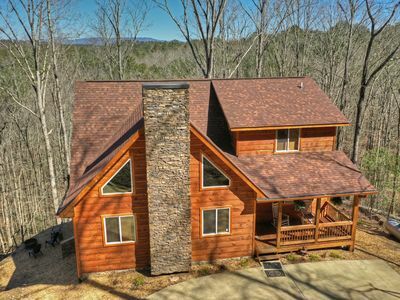 You will love this secluded mountain cabin Everything is waiting for you. 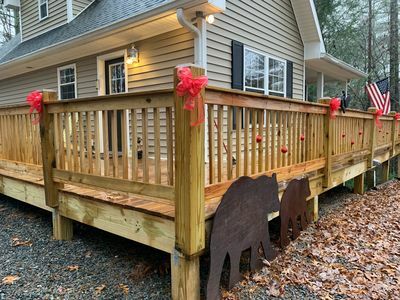 This clean and comfortable cabin, with wall to wall hardwood floors, boasts 3 spacious bedrooms, 2 1/2 baths, including a large master bath with garden tub and separate shower, a large kitchen and great room, and a full size laundry room. Everything you need to make your get away a memorable experience. Whether you are looking for a quiet, relaxing, romantic retreat or a comfortable place to spread out and relax after a full day of fun and adventures. Perfect for family vacations, romantic couples retreat or fun filled girls or guys getaway. Whatever you are looking for, it can be found at "Peace" of Heaven. 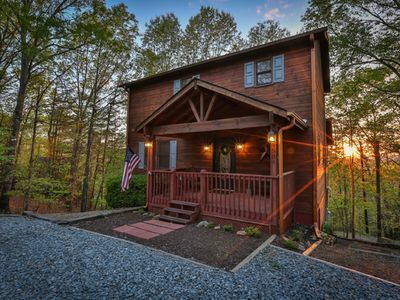 "Peace" of Heaven Cabin is nestled among the white pines, hickory and red maples in the North Georgia Mountains. 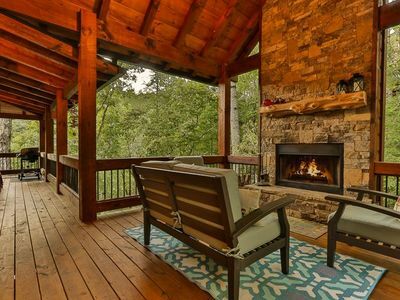 Sit outside on the large wrap around porch and read your favorite book or just sit out and wait for the deer to come out of the woods to feed. 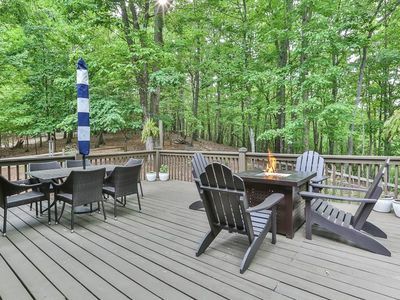 Or sit out by the fire pit and make smores and roast weenies while watching the lightning bugs fly around lending a magic twinkle to your summer night. 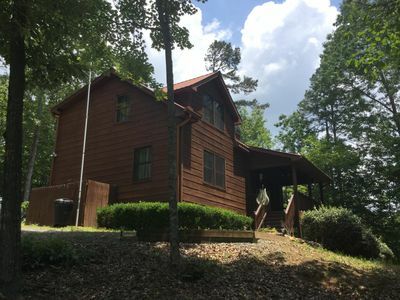 "Peace" of Heaven Cabin is located in the beautiful Coosawattee River Resort with gated access and paved roads almost right up to the gravel driveway. There are 5 separate parks throughout the resort, as well as a stocked fishing pond. Catch as many fish as you want, there is no fishing license required. There are also walking trails, fishing rivers and creeks, as well as boating and fishing close by at Carters Lake. The General Store located right in the resort will get you set for a fun filled day of tubing or kayaking down the Coosawattee River. While the cabin is nestled in the woods and gives the feeling of being far from the rest of the world, it is really very easily accessible. A 15 minute ride will take you to the beautiful downtown Ellijay where you can visit the specialty and antique shops or sample some fine local cuisine. 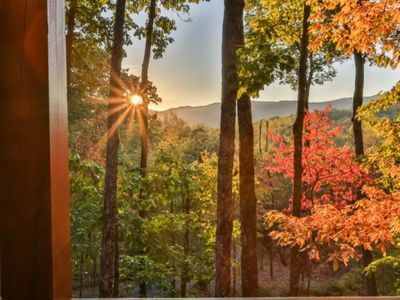 A short drive will take you to the beautiful Amicalola Falls and State Park, several nearby wineries, or to any of the nearby apple orchards, where during season, you can pick your own apples. 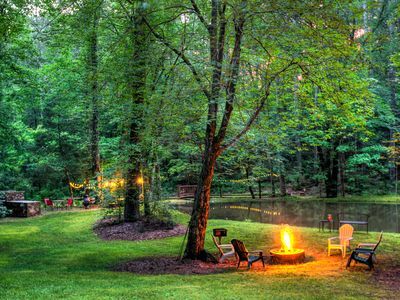 Once you are here, you may not want to leave, but if you do want to venture out, you are just over an hour from Atlanta and also Chattanooga. A short drive can take you from North Georgia to North Carolina and Tennessee for a fun filled day of sightseeing. 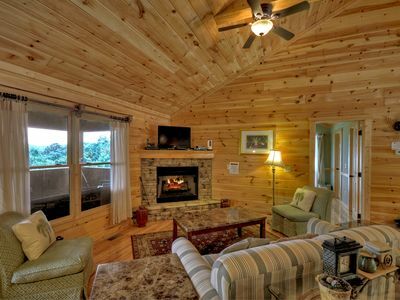 "Peace" of Heaven Cabin offers a comfortable floor plan with a large master suite on main level with master bath and 2 additional large bedrooms and a full bath upstairs. You will find a comfortable living area with a wood burning fireplace, fully equipped kitchen with stainless steel appliances and dining area as well as a laundry room with full size washer and dryer and a half bath. "Peace" of Heaven is truly just that. Whether you come for fun and adventure or just relaxation and tranquility, you can find whatever you are looking for here at "Peace" of Heaven. Relax, enjoy and make yourselves at home! Located in the middle of everything. Take a short drive to Atlanta shopping and night life, Six Flags, Stone Mountain and Snow Mountain, Atlanta Aquarium and so much more. Same distance to Chattanooga where you can "See Rock City" , the aquarium, and so much more. 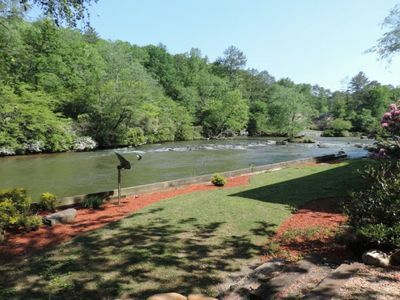 Surrounded by beautiful state parks, water falls, horseback riding and much more. Or make a day trip to the Great Smokey Mountains, Cherokee, or Gatlinburg. 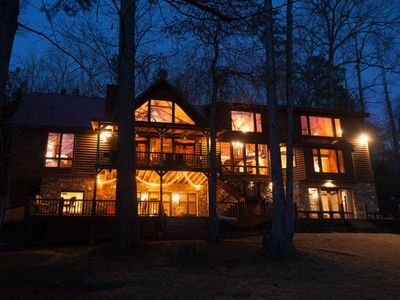 Come home at night to your very secluded get-a-way in the woods and relax by your very own campfire. 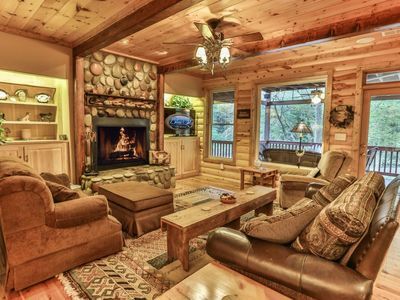 Family friendly private cabin with outdoor wood burning fireplace!